In a large stock pot, place 8 cups of water and 3 oz piece of rind from a wedge of Parmigiano Reggiano cheese. Simmer over low heat for several hours or until reduced by half. Strain and store in the refrigerator for a week or in the freezer for three months. Heat the oven to 400ºF. Place the sweet potatoes on a baking sheet lined with aluminum foil. Bake for 45-60 minutes, or until tender syrup is oozing. Cool slightly. When cool enough to handle, halve the sweet potatoes and scoop out the flesh into a mixing bowl. Add the honey, Chinese five-spice powder, and salt. Stir to combine, adjust the taste and just if needed. 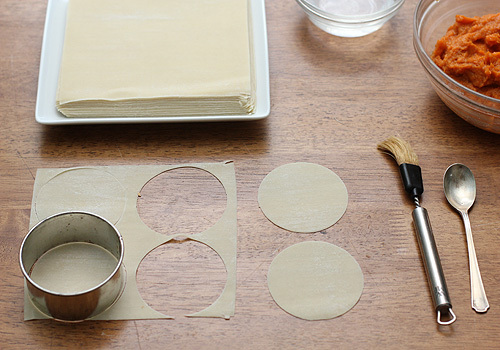 Prep your pasta-making station: the ravioli filling, pile of egg roll wrappers, a 2 3/4 in circle cutter, a small bowl of water, a pastry brush, and baking sheets lined with parchment paper. Using the circle cutter, cut 4 circles out of each wrapper. Place a teaspoon of filling into the center of 2 of the circles. Dip the pastry brush into the bowl of water and wet the edges of all 4 circles. Place the non-filled circles on top of the filled circles and seal the edges. 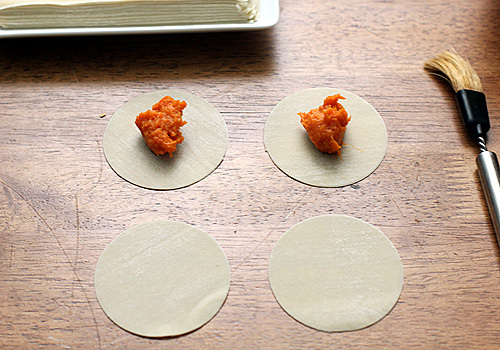 Place the ravioli a baking sheet. Continue with the remaining wrappers and filling. 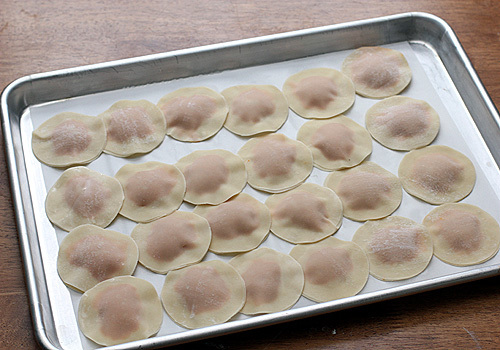 The ravioli can be used right away (serve 6 per person) or frozen on the baking sheet. Once frozen, transfer them to a freezer bag and freeze for up to one month. When you are ready to serve, bring a large stock pot of salted water to a boil. In a saucepan over medium-high heat, add the butter. Melt the butter and continue to cook stirring continuously until the milk solids have begun to brown (careful not to burn). Remove from the heat and immediately add the sage leaves and stir for 1 minute. Add the cheese broth and season with a pinch of kosher salt. Return to the heat and bring to a simmer. In a small bowl, combine the cornstarch and water. Remove the sage leaves from the broth. Pour the cornstarch mixture into the broth. Stir until lightly thickened. When the water has come to a boil, drop 48 of the ravioli into the pot. Gently stir to keep from sticking to the bottom. They should rise to the surface within 3 minutes. Using a slotted spoon of perforated skimmer, remove the ravioli from the water and divide them among the serving bowls. Ladle 1/2 cup of the broth into each bowl and garnish with the scallions. Enjoy! Wow! Can not wait to try this one! Just got home from the store since I wanted to make this tonight and freeze for tomorrow. Having trouble finding the Chinese Five Spice. Not at our local supermarket here in Florida. Do you know if they have it at The Fresh Market or any other place you can recommend? I would imagine The Fresh Market would carry it. They have a wonderful herbs-n-spice section. 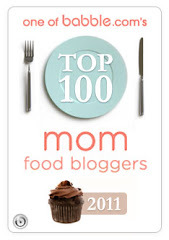 Might want to call them first to double check:) Glad you are trying the recipe! Thank you! I hope you enjoy it as much as we did. It's the cheese broth that caught my attention. I have several go-to recipes for when I've finished a wedge o' parm, but this one will certainly be prioritized to the top of the queue! Yum! What a beautiful, ethereal looking dish. Lovely photograph! 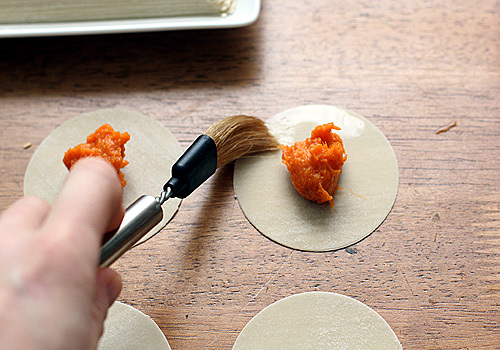 Brilliant idea to use wonton skins too. These sound like heaven on a plate. Perfect for a holiday gathering, especially because they look like something you absolutely slaved over, yet didn't. Love that! 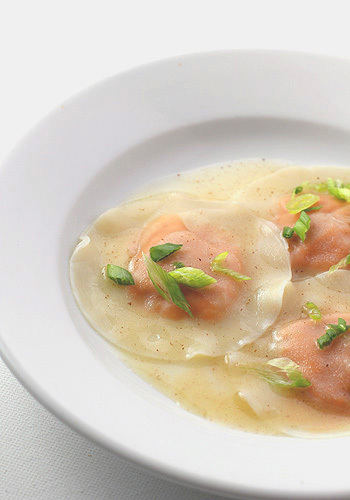 I have just recently made ravioli for the first time and am eager to try this recipe! Thanks for sharing! I am pleased that you stopped by:) Thank you for the comment. 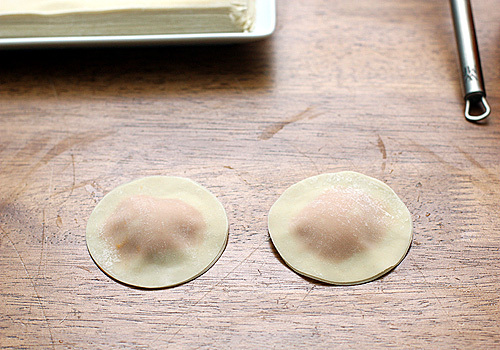 Homemade ravioli are fun to make and they taste better too. Enjoy the recipe. Thank you:) The wonton wrappers do make for a delicate dough. This was amazing! I had a ball of spinach pasta dough in the freezer, leftover from another batch, so I rolled that out to use for the ravioli dough. We usually use wonton wrappers like you've done, but I thought the spinach would go well with the other flavors, and did it ever! I also left out the honey from the filling, b/c our sweet potato was quite sweet, and made a Pecorino broth. My fiancée and I *really* enjoyed this. Definitely a make again recipe. 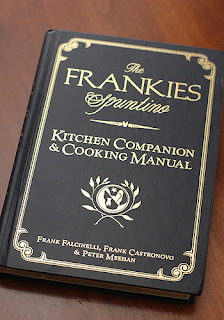 Congratulations on winning the cookbook! Greetings! I've been reading your blog for some time now and finally got the bravery to go ahead and give you a shout out from Dallas Texas! Just wanted to tell you keep up the good work!